"Just as with any major cargo and ferry port, e.g. Livorno Italy, in the port of Civitavecchia it will also be impossible for you to get off the ship and walk straight into town..."
If the name of Civitavecchia Italy popped up in your itinerary when you were choosing your next Mediterranean cruise and you didn’t know what and where it was… you were not the only one! What is the importance of the Port of Civitavecchia? By now, we’re sure, you already know that this little town, the port of Civitavecchia, is one of the oldest ports in the Mediterranean and is just a gateway for your day trips into Rome or a home port where you will start and end your cruise. The port of Civitavecchia was faounded at the end of the 2nd Ct AD when the Roman emperor Trajan built a port that would cater to the ancient city of Rome. Today, this port is one of the main connections between the mainland Italy and the islands of Sicily, Sardinia and Malta as well as the Spanish city of Barcelona. It contains more than 20 piers many of which are used by ferry and container ships, but 11 are available for cruise ships. 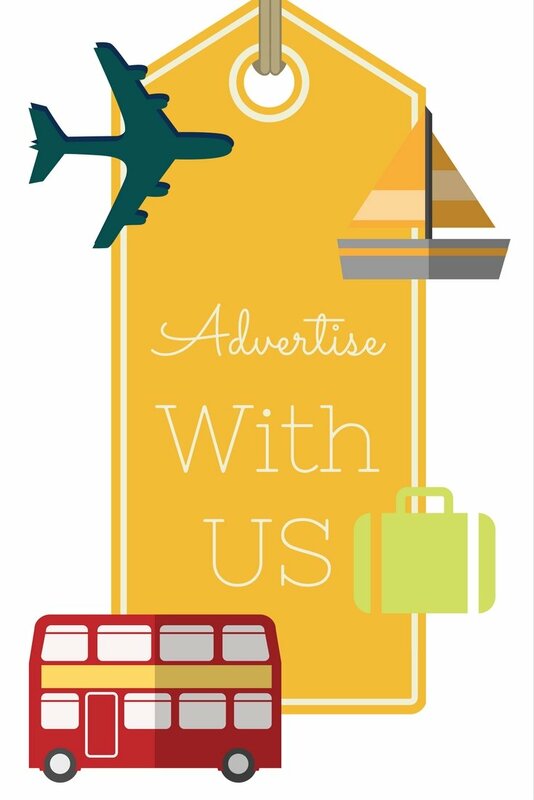 All major cruise lines dock here: Royal Caribbean, Princess, Costa, Oceania, Celebrity, Holland America, Seabourn, Regent Seven seas. Today, this port handles approx. 2 thousand ferry and cruise ship movements a year. That is nearly 2 million passengers a year which makes it the third busiest Mediterranean port after Barcelona and Genoa. How do we get from the port of Civitavecchia to Italy, Rome? Just as with any major cargo and ferry port, e.g. Livorno Italy, in the port of Civitavecchia (port of Italy, Rome) it will also be impossible for you to get off the ship and walk straight into town. First of all the distance between the cruise ship dock and the port exit is too far, and second, with all the trucks and containers being moved around it is too dangerous to roam around. 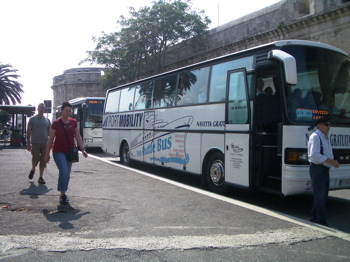 That’s why the port of Civitavecchia has organized free shuttle buses from cruise ships to the port exit/entrance, which is just steps away from the Civitavecchia city centre. 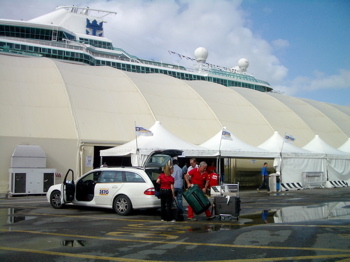 If you have organized a private tour or transportation for the day, make sure you know if your driver will be picking you up inside the cruise terminal, right by your cruise ship or by the port exit! All the buses will have signs displayed with ships’ names on so you don’t have to worry about taking a wrong bus and ending up at a wrong dock when coming back. 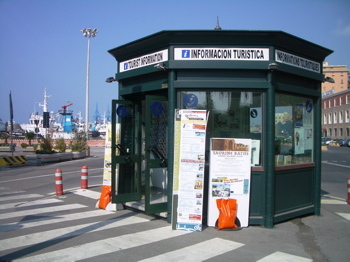 Where you get dropped off, there is a little info kiosk if you need some last minute information on your way from Civitavecchia to Rome. As you exit the shuttle bus stop area, you will find yourself on one of the main Civitavecchia streets, just across the street from McDonalds, which you can locate on our Street map of Rome Italy Port - Civitavecchia. If you’ll be taking a Civitavecchia Rome train into Rome, you’ll be happy to know the train station is just 10 minutes walk from the port exit. As you’re facing the McDonalds just take the road to the right…you’ll be walking a wide sunny street with a few hotels and restaurants along the way. It is actually the waterfront of the port of Civitavecchia. If you stay on the left hand side of the street, with the sea on your right, after 10 minutes you will reach the train station building. Now that you know how to reach the train station in Civitavecchia, make sure you read our article Civitavecchia Rome train to find out how to go about taking a train from the port of Civitavecchia to Rome.